Individual firefighters - Physical fitness, psychology, physiology and other human factors that affect the health and safety of first responders. Environment - Impact of fire ground environment on the health and safety of firefighters, and the effect of suppression techniques on structures. Tools and equipment - Research, development and testing of tools, equipment and technologies for fire suppression and rescue scenarios. 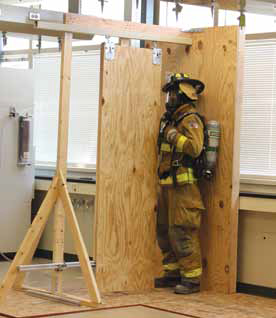 IFSI's commitment to research has resulted in many advancements in firefighter health and safety, but that research requires extensive resources. The rapidly changing work environments that firefighters face present many challenges. Institute researchers are constantly working to develop new techniques and technologies for dealing with modern hazards and rescue situations. 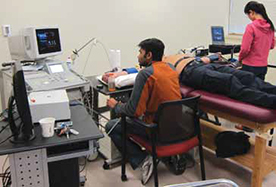 There's also a special need for high-technology equipment that is seldom covered by grant funding. To meet these needs, IFSI has established a special fund for enhancement of our research programs. With support from businesses, organizations and corporations, the Firefighter Life Safety Research Fund can help IFSI undertake new research, acquire specialized equipment and maintain the world-class facilities that have established our leadership in fire fighting research. Your contribution to the Firefighter Life Safety Research Fund is an investment in improving the safety of firefighters and the citizens they serve. Your contribution is fully-deductible. The IFSI Firefighter Life Safety Research Fund is part of the University of Illinois Foundation, which is a 501(c)3 non-profit organization and will provide full support documentation for your contribution.